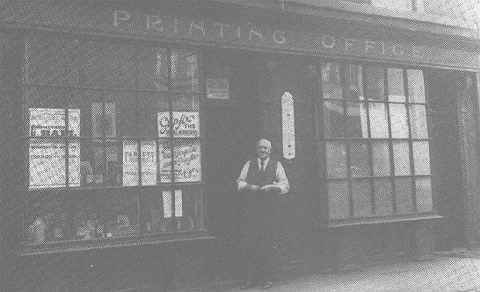 The first recorded date for a printing establishment on Market Lane in Barton is 1830. This can be found in the Pigot and Companies Directory. It is recorded that the establishment was owned by one Abraham Squire. Although this is the first record found it is believed that the printing works was opened quite some time before this date. The printing works changed owners in 1832 when it was taken over by Charles Ball, and was to continue trading within that family for 106 years. 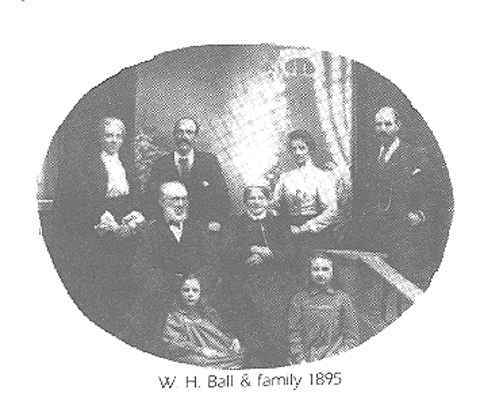 Charles Ball had grown up within a printing family as he was the son of a Thomas Ball who had had a family printing business on Wrawby Street, Brigg since 1804. The church records in Barton show that Charles married a Mary Willford in December of that same year and so it seems that this was their marital home. Charles died at the early age of 42 in 1855 and left his wife and their eldest son Henry to continue the business. Before his death Charles had become intrigued with the history of Barton and had spent several years researching the subject and compiling a book on the history of his adopted town. Unfortunately he did not live to see the book actually in print as it was not published until a year 1856. The book entitled "The History of Barton" had its type hand set mostly by Henry himself. Only 250 of these books were ever printed and very few have survived. The present day owner of the printing business Barrie Newton does own one of the original books. Barrie is also the very proud owner of the original hand engraved blocks which were used on the book. Henry Ball like his father was also interested in history. Henry's interest though was in old books and documents. He took such an interest that he in fact became one of the North's greatest authorities on the subject. He is also believed to have spent some time studying under Sir Isaac Pitman the founder of shorthand, who lived in the town for some time. Henry was also the equivalent of the Postmaster for the town for many years as the shop attached to the printing works was the towns Stamp Office ( the for runner of the Post Office ). Henry became very well known, not just within the local area or even the North but, it is on record that he also knew the statesman William Gladstone quite well. He also became well known within Europe and even America as the people visited his shop. One of Barton's early exporters. Henry married Elizabeth in 1860 and they had tree children, two daughters and the youngest a son named Thomas Henry. Whilst raising this family the print work derived much of its income from printing many of the papers in the area. It is known that they printed the papers for Brigg, Caistor, Winterton as well as Barton. They also printed the North Lindsey Observer which would be distributed to all the towns and villages. Henry died in 1914 at the grand age of 81 leaving the business to his son Thomas Henry who carried on printing until his retirement in 1938. The picture opposite was taken of Thomas Henry in 1934. John Lovitt who was known as Jack had worked for the Ball family from being 14 and it was to him that Thomas Henry Ball offered the business. Jack Lovitt took over the printing works and the shop and continued printing. It was during the time of Jack Lovitt and his son Terrence that there were many changes in the printing industry and Jack and Terrence kept the works at Barton well in the forefront of the new technology. They introduced hot metal casting, powered printing presses, folders and stitchers. When offset printing was invented they introduced it into the works to allow them to continue supplying the local businesses of Halls Ropery and the Hoppers Bicycle Factory. Sadly Terrence died at the young age of 38 which forced his father to return to work out of retirement. It was in 1979 that Jack finally had to retire and so find a new owner for the Printing Works. Like the owner before him he turned to one of his employees and so the works was taken over by Barrie Newton who had worked for Jack since leaving school. Barrie who is the present day owner of the works has continued to introduce the latest technology into the works which receives orders from all round the globe. Gone is the old delivery bike, the pot bellied stove, the hot metal type set and the hundreds of type cases and noisy letter press machines but it is always important to look back at those who had the foresight and the knowledge to set up the works all those years ago. My thanks to Barrie Newton for the information and also allowing me to reproduce the pictures used on this page.